The report by the global, collaborative commercial real estate services firm includes insights from 35 North American markets. “This report demonstrates that industrial/retail product is being redefined in Canada, the U.S. and globally as the Internet plays an increasing role in the sale of consumer goods,” Mark E. Rose, chair and CEO of the Toronto-headquartered firm, said in a media release. The report determined that in Canada, “construction is slightly weighted towards speculative projects offering larger bay sizes and higher clear heights. The release says the “Canadian industrial market collectively reported a vacancy rate of 4.6 per cent, up 20 basis points (bps) year-over-year in the first quarter of 2014” with Ottawa reporting the lowest vacancy rate at 2.8 per cent and Guelph reporting the highest at 6.8 per cent. Across the country, single-digit vacancy rates remain. Not surprisingly, the report indicates Toronto is the biggest development market with 2.6 million square feet underway (29 per cent share of the national total) primarily within the Toronto west submarket. Vancouver follows at 2.2 msf. Driven then by e-commerce, warehousing and supply chain demands, the report notes a trend in the design of industrial facilities since 2013 also includes energy-efficiencies and low-maintenance designs through higher-grade materials. The report predicts a softening in the market over the short term as newer, more efficient projects are brought to market, and notes that “early indications can be seen, such as the flattening vacancy, availability and rental rates in GTA West” and indicating an increasingly competitive environment. 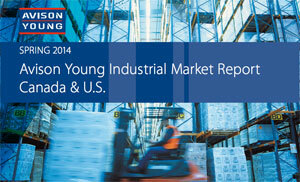 The American industrial picture is also positive, but for different reasons, Avison Young reported. Avison Young’s corporate office is located at 18 York St. in the LEED Gold Southcore Financial Centre.